The spirit of America is taking over the globe. 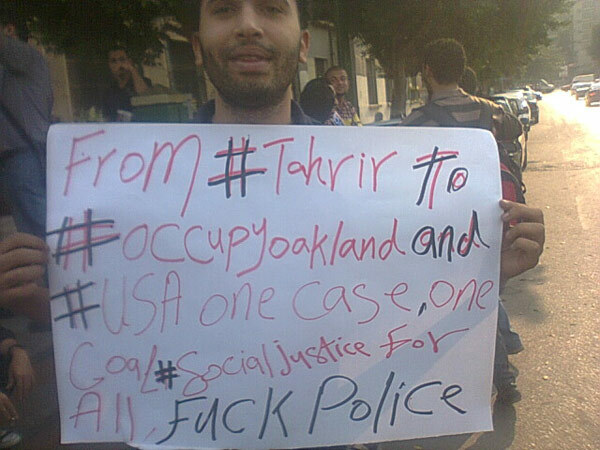 Protesters in Cairo are holding up signs to show that they stand with the protesters on Wall Street and in Oakland. 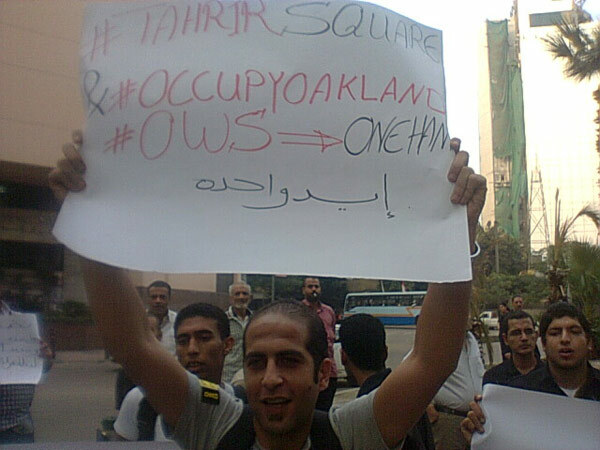 There are now Occupy movements worldwide. For the first time since World War II, Americans have shined the beacon across the world and said, NO MORE. And the world has joined them. Whether you agree with the Occupy Movement or not, this is an amazing moment. The world, for the first time in my life, is coming together in solidarity. In streets all over the globe, people are standing together, their voices united. This movement has trumped religion, politics, race, culture. It has spread virally through country after country. I could be argued that this movement had its seeds in the Arab Spring, and to some extent, that is true. The Arab uprisings in Egypt and Tunisia reminded the world of the power of Gandhi and Martin Luther King’s admonishment of nonviolence. There is an unstoppable power in standing calmly while the Powers that Be attack forcefully. The images created by a Selma or an Oakland resonate for a generation. The picture of the woman offering a flower to an MP in Arlington remains one of the most iconic images of the Vietnam War Protest movement. While the Arab Spring reminded the people of their power to stand against injustice, it took the Americans to capture the Zeitgeist of that moment and turn it into something bigger. Most of the world is not ground under the heel of a dictator, and while there was massive global support for the protesters in Tahrir Square, it was support from the sidelines. Occupy Wall Street made the battle for freedom personal. The true danger to liberty in the world is not just from governments, it is from the corporations that run those governments, and the Occupy movement is taking the fight to that shadow government. In almost every country in the world, the Oligarchs and Plutocrats pull the strings of government. As a window on this, look at the copyright bills in play before the E.U., the Canadian Parliament and the U.S. Congress. All three have massive, freedom of speech eliminating bills before them. These bills would essentially shut down the free flow of information on the internet, subjecting it to the same degree of censorship that countries such as China already impose. And this termination of free speech would occur in the name of copyright protection. As Corynne McSherry puts it, “Hollywood finally has a chance to break the internet.” All of the “First World” countries are involved in this movement to essentially stop the internet cold. Under these bills, sharing videos on Youtube of a news report would be illegal, singing a cover of a song would be prohibited, even posting a picture that you do not own could result in jail time. At the risk of sounding like a conspiracy nut (which anyone who knows me, knows that I try to avoid that) I do question the timing of all of this. Suddenly we have companies trying to force through massive restrictions to internet speech at the same time the internet is the mode of communication that unites a global protest movement that has corporations in the crosshairs. The timing, while possible coincidental, seems awfully convenient. I think this move by the corporations is doomed to fail. I think it will become a “let them eat cake moment.” (Although Marie Antoinette never said that, and is actually a much more sympathetic character than the anecdotes would imply) These actions by corporations show their complete disconnect from reality. Another example is the amazing pictures of a mortgage foreclosure specialist firm holding a homeless themed Halloween party. The Occupy Movement is spreading, people are standing together, people are saying enough. And this gives me hope for tomorrow.